Half-hardy cormous perennial with erect lance-shaped leaves and branched stems bearing spikes of 5-18 pink-suffused, cream or pale yellow flowers in spring and summer. To 90cm. [RHSE, CECB]. 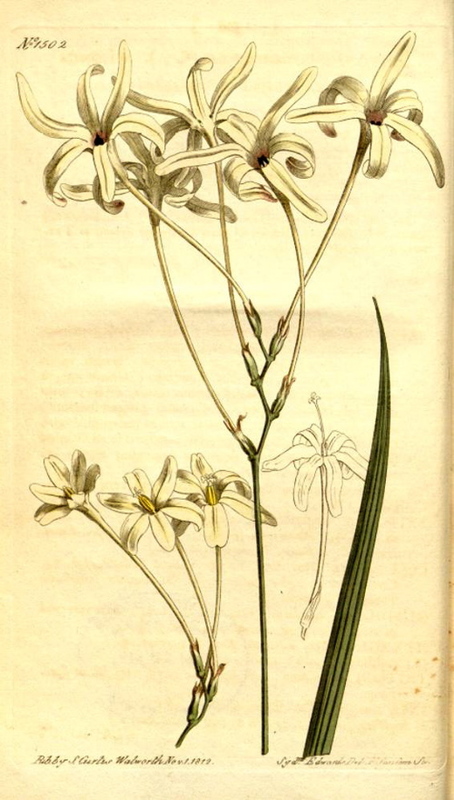 ‘We are not acquainted with a tribe of plants which stand more in need of elucidation than those of this genus; of the vast numbers imported from the Cape within these few years, where they are mostly natives, and that for the most part by way of Holland, few comparatively are well ascertained; some of them appear subject to great variation, both in the size and colour of their blossoms (whether in the wild state they are thus inconstant, or whether there are seminal varieties raised by the perservering industry of the Dutch Florists, we have not yet had it in our power satisfactoralily to ascertain); others like the present one [Ixia longiflora] have their characters strongly marked, and less variable; in general they are plants of easy culture.’ [BM t.256/1794]. Also figured at BM t.1502/1812. Tritonia longiflora was introduced to Britain in 1774. [JD]. First recorded in an Addendum to the 1843 catalogue and then in each subsequent edition [B.430/1843].